The famous hard drive manufacturer, Western Digital, has been doing excellent recently. Having conquered the second place among hard drive manufacturers and forced back such a giant as Maxtor to the third place (only Seagate is out of WD's reach so far) in 2004, Western Digital hardened to the decision to become a leader on the ATA-drives market, especially as it took the overall (considering all drive categories!) second place even though WD did not manufacture (to be more exact, it didn't manufacture them at that moment) SCSI drives and small form factor drives (2.5-inch and smaller). That is, it's entire outstanding turnover in 2004 is just owing to 3.5-inch ATA-drives, while all the main competitors (Seagate, Maxtor, and Hitachi) also work in more profitable segments — SCSI and/or mobile drives. Another confirmation of WD's success has become a recent announcement of results for the third fiscal quarter of 2005, which ended on the 1st of April: drive sales have grown almost by one third compared to the same period last year (from 11.8 to 15.3 million drives), the total revenue amounts to 920 million dollars compared to 749 millions, and the net profits have increased from 47.9 to 70.8 million dollars. Such results surpassed forecasts of third-party analysts as well as internal expectations. Western Digital links such a high growth of its revenues in this period (traditionally calm on the market) with the fact that the company staked at the right time on hard drives for consumer electronics, not only for PCs. As you may remember, the market of hard drives for PVR, DVR, set-top boxes and play stations has been growing faster than even the most dynamic computer sector — mobile hard drives. While the average annual growth of the latter is at about 22%, the market of hard drives for consumer electronics (so called consumer segment) is growing over 50% a year. And its growth rate is not going to change in the nearest future (see the diagrams at the link above). The share of hard drives for consumer electronics, portable devices, notebooks, and servers takes up 23% of the company's turnover (the rest 77% are still intended for PC), while this share was only 14% a year ago. You should also take into account that WD has not yet deployed the mass scale production of ultra-portable one-inch hard drives (it's planned for the second quarter). Against this favorable financial background WD management announced not long ago (at the end of 2004) that the company would not rush platters of a higher density in its 3.5-inch models and that it prefers time-proven 80GB platters for Caviar drives (that is desktop 3.5-inch mainstream models). At the same time, at the beginning of 2005 WD nevertheless started to switch to platters of higher density and actually updated its Caviar model range, having launched new senior (in their lines) WD3200xx 320GB models, based on three 106.7GB platters. Such drives have become available to customers in 2005. 320GB models are the first-borns of the new technology (new WD platter density). The manufacturer claims that the junior 40, 80, 120, 160, 200, and 250 GB models (with 8MB or 2MB buffers) will gradually switch to these platters as well. Some of them will obviously have "clipped" platters, that is formatted for smaller capacity. 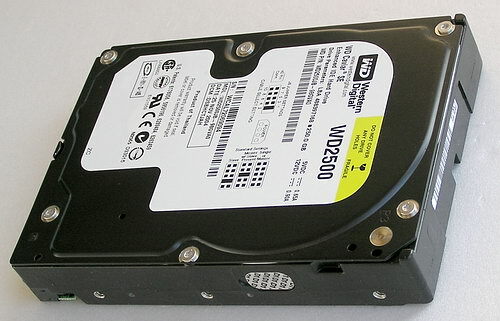 The WD3200JB drive with 107GB platters, used in our tests (manufactured on February 2005). (though the serial number of any drive can be used to learn everything from the internal database). That's why during this transition period, i.e. 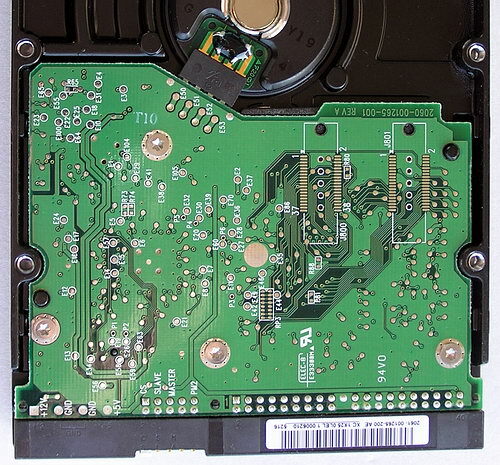 until the production is switched from 80GB to 100-107GB platters completely, we can come across hard drives with the same model number but with different platter/head configurations, different controllers (see below), and different performance. That has happened many times with WD — for example, when the company switched from 40GB platters to 60GB and 80GB ones. Customers will have to put up with this confusion again. However, things have become much better recently — at present WD tends to discontinue models with the same capacity and different geometries, that is a given capacity will definitely correspond to the number of heads. The current and future WD platter line is 80,100,107, (125,133) GB. The list of configuration options is as follows. 320GB drive has three 107GB platters. (Why 320, not 300, as the other manufacturers do? That's probably a marketing decision, because there is a 160GB model and the new one will be twice as capacious. By the way, there is no such drive as 4 x 80GB, as you could assume from the 320GB capacity, though a 4-platter WD model will soon appear — it will be a 400GB model with SATA II interface). Less capacious drives of the new generation will be based on 100GB platters: 250GB model will have 5 platters, 200GB — 4 platters, and so forth. WD2500JB drive, which we used in our tests, is based on 83GB platters (manufactured at the end of November 2004, we took it from a large retailer shortly before this review was published). For now, all junior (less than 320GB) WD models on the market belong to the previous generation (for example, a 250GB model has three 83GB platters). We'll take this very model (WD2500JB) to compare it in this review with the new WD3200JB. This party also includes the WD2000JB model (manufactured in 2003) that differs from them by still less capacious 67GB platters (and the corresponding linear read rate). The WD2000JB drive (manufactured in 2003) that we used in our tests. Thus, in this review we are going to compare three latest generations of WD Caviar SE drives (8MB buffer), represented by senior models in each generation — with 107, 83, and 67 GB platters. Not to overcrowd this review with results, we are going to limit ourselves only to IDE models, because SATA drives from WD do not support NCQ so far and their performance in the majority of applications is almost identical to that of UltraATA/100 models. Especially as Caviar SE drives use a large 8MB buffer — it was WD that started to use it in Caviar SE drives in 2001. What concerns the latest generation of Caviar drives, the company used improved caching algorithms and managed to obtain higher performance compared to WD Caviar drives of the previous generation as well as to compete with hard drives equipped with a 16MB buffer (that's what we'll try to sort out). Besides the increased capacity and performance, the company stresses that the new models differ by reduced thermal emission and lower operating temperature. The reduction of the operating temperature in these devices allows to raise their reliability in various configurations of modern systems in the long-term outlook — it's really relevant in consumer electronics with passive cooling only. Besides, a lower operating temperature contributes to the increased reliability and service life of the drives. The key specifications on WD hard drives, taking part in our review, are provided in Table 1. Table 1. Key specifications on Western Digital Caviar SE UltraATA drives compared to those of their predecessors. So, besides the increased capacity and data density, the new WD drives stand out against their predecessors by slightly increased linear transfer rates, less power consumption/thermal emission, and more silent (that is noiseless) operation. Non-operating shock of WD drives is still a tad worse than in competitors. Besides, the allowed operating temperature is a tad narrower — some manufacturers currently offer from 0 to +60 degrees. In return, the power consumption during data transfers is unprecedentedly low for a desktop 7200rpm drive. The model line also got shorter due to hard drives of small capacity. It was decided not to enlarge the drive buffer so far and to leave it at 8MB, though a 16MB buffer is already advancing (WD promises that its models with a 8MB buffer will have performance of the models with a 16MB buffer due to better caching algorithms). It's claimed that WD managed to reduce Caviar noise to the levels virtually below the threshold of human hearing due to the unique WhisperDrive technology. To cut seek noise, the Soft Seek technology streamlines read/write seeking algorithms, resulting in the drive operating more efficiently. All WD Caviar drives protect the stored data with the help of the proprietary embedded Data Lifeguard technology for error diagnostics and repair. It automatically detects, locates, and repairs errors, which may appear on the hard drives with the passage of time. WD drives are manufactured on plants in Malaysia and Thailand. The manufacturer offers a three-year warranty for these drives. The new WD Caviar SE drive has striking differences from its predecessors even at first sight. Firstly, the company changed the color of their storage devices some time ago (it also concerns the generation with 80GB platters) — a year ago (and earlier) these drives had traditionally unpainted metallic upper cover of the base (see the photo of the WD2000JB above and our WD2500JB/JD review), but in the middle of the last year the company switched to black upper covers of its desktop drives (see the photo above). The form of the cover changed only insignificantly. In my opinion, WD drives got a more stylish look after such an exuviation, though it hardly had an effect on technical characteristics of the drives (the black color of a body is considered to improve its thermal properties, but I don't think that the effect will be noticeable in case of the cover). You will see much more differences on the back of the drive. 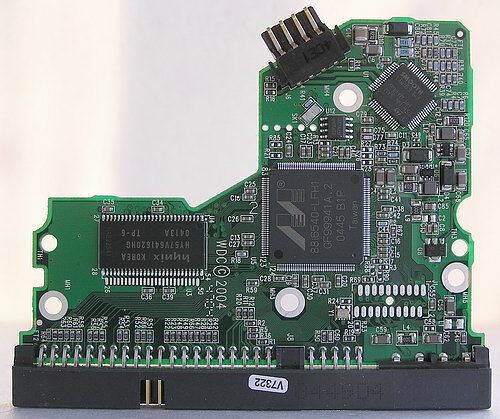 The WD3200JB drive, bottom view, the controller board from the back side. 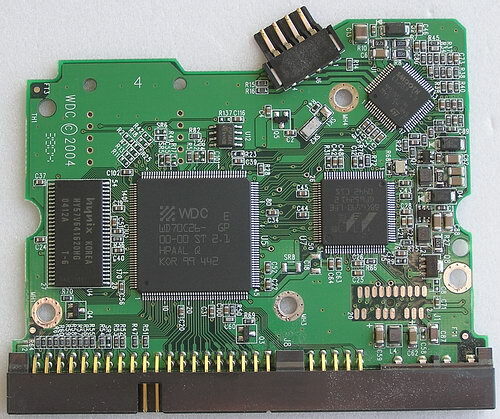 The controller board of the WD2500JB, manufactured in late November, 2004 (the previous generation of platters), which has taken part in our tests. That is the upgrade from 80GB to 107GB platters has been accompanied by the change in the elementary base — a signal processor of a drive: two chips (from WD and Marvell) have been replaced by a more advanced chip from Marvell (88i6540). By the way, the changes in the controller board were not so cardinal at the previous alternation of WD Caviar SE generations — compare two photos below as well as photos in the article at www.ixbt.com/storage/wd-2500.shtml with the controller board above. The WD2500JB (November 2004, on top) and WD2000JB (2003, on the bottom) drives, taking part in our tests, a view from the board. Probably, the measures taken to reduce the "thermal pack" in the new drives had to do not only with the mechanics, but also with the electronics of storage devices. I repeat, in order not to overcrowd this review with test results, we'll limit ourselves only to IDE models, because SATA drive performance without NCQ support (there are a majority of such drives on the market so far) is almost similar to that of UltraATA models in most applications, especially as all hard drives in this review use a large 8MB buffer (and larger). So, we can use these test results to estimate the performance of similar SATA models. 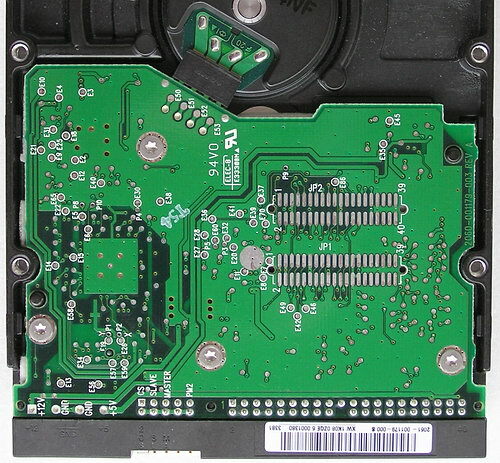 The hard disks were firmly fixed on the metal chassis of the chassis and connected to UltraATA/100 controller on the ICH5 bridge of the motherboard. The main hard disk was installed as master on the first channel of the chipset controller, and a hard disk to be tested was installed as master on the second channel of the same controller. All the hard disks tested in this review had no problems with overheating and deterioration of characteristics at least during the six days of intensive testing. No additional cooling (special coolers and fans) was provided for the hard disks. Before the tests, we warmed the hard disks for 20 minutes using a utility with active random access. At first, let's have a look at the linear read rate graphs for the latest three generations of WD Caviar SE drives with 107, 83, and 67 GB platters correspondingly (click the icons to see full-sized graphs). Intergeneration changes are obvious. The linear transfer rates are not strictly proportional to the square root of the platter capacity, there are certain deviations. For example, the data density along the tracks has grown by almost 10% (by 9.5% at the beginning of the drive, by 7.3% at the end, and by 8.4% on average) at the upgrade from 83GB to 107GB platters, while the track density along the radius has grown by approximately 20% (judging from the average platter capacity of 106.7 and 83.3 GB). Note that the previous platter density change (compare the graphs above for the WD2500JB and the WD2000JB) took less poll — only 3.8% of the data density growth along the tracks at the beginning of the disk. Strictly speaking, the WD2000JB drive, taking part in these tests, uses almost the same platters and heads that were used a year and a half ago for the WD2500JB/JD (compare its read graph with the read graphs for the models reviewed at www.ixbt.com/storage/wd-2500.shtml) — the start and the end linear read rates are almost the same in these drives, the only difference is the zone distribution along the drive volume. That is a different average track density along the radius was used depending on the formatted density of the platter (83GB or 67GB), though the first and the last disk tracks were located approximately in the same locations (at the beginning and in the end). So we can draw a conclusion that WD improved its magnetic recording technology some time ago (probably in mid 2004) having increased the linear read rate (that is the data density along the tracks) and decreased the track density. 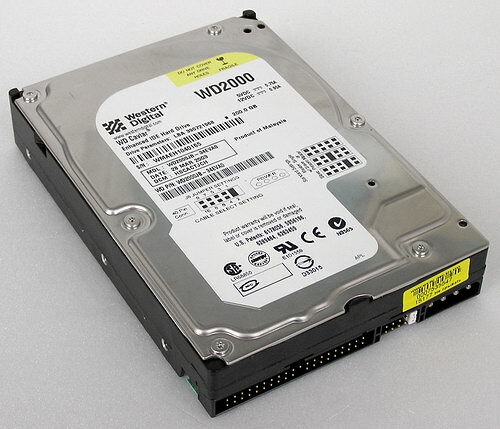 The WD2000JB drive, taking part in our tests today, represents the early first generation of 80GB WD platters rather than the generation of 60-67GB platters, while the WD2500JB drive, manufactured in November 2004, is a representative of a later, improved technology of 80GB WD platters with better linear transfer rates (these drives are currently available in stores). Similarity of the drives' controllers corroborates to this fact. At the same time I want to note that a detailed analysis of linear disk transfer rates of all the three WD Caviar SE drives (on the analogy of the Seagate Barracuda 7200.8 review, for example) did not reveal any signs of the so called adaptive formatting (when each platter side is formatted to individual linear data density in order to reach maximum transfer rates depending on coating properties and characteristics of each head). However, it does not strike off this feature in these drives completely, because it may be hidden by the translator of the physical disk space into the logical. And what concerns the upgrade to 107GB platters, WD evidently improved its positions here — the WD3200JB drive gets the silver medal among the modern 7200rpm ATA drives in the maximum and average linear read rate, having been outperformed only by Barracuda 7200.8 with 133GB platters. But it definitely outperforms both competitors with 100GB platters (Seagate Barracuda 7200.7 200GB and Maxtor MaXLine III and DiamondMax 10) and of course it outscores the drives based on 80GB platters (see the diagram). The new WD3200JB drive is slightly outperformed by its competitors and even by its predecessor in the UltraATA/100 interface transfer rate, though with the 8MB buffer this small defeat will hardly have an effect on anything. But then WD drives demonstrate excellent results in the real average access time: though it's hard for them to compete with Hitachi/IBM drives in this parameter, WD drives are definite winners among the other competitors. However, Seagate drives are configured for quiet seek mode here, while in performance seek mode Seagate drives are theoretically capable of competing with WD Caviar SE drives in access time. There is also another interesting point here — WD Caviar SE drives from the latest generations officially support the seek acoustics (and performance) control via the Acoustics Management register. WD drives used to have no seek acoustics management before or it was in the bud. And the operating noise in senior WD drives (e.g. the WD2000JB and its counterparts) was rather ugly. However, WD has worked hard on this issue the last year resulting not only in a significant spin noise reduction, but also in an expert approach to the seek performance/acoustics management policy. As a result, the WD3200JB and the WD2500JB under review (as well as the WD2500JD, manufactured at the same period of time) officially support two seek modes — Performance Mode 0 and Quiet Mode 3. The former (default) mode is enabled when 254dec or 255dec is written to the register (255dec for the WD3200JB and the WD2500JD by default, 254dec for the WD2500JB) and the latter — when the register contains 128dec. An attempt to write any other value to this register (from 129dec to 253dec) results in the register automatically resetting to 128dec (that is the maximum quiet seek). WD drives used to have the same register values (without resetting, this time) for quiet and noisy seek modes before. However, the average seek time of 7200rpm Caviar models would change only by 1ms and made practically no sense. And now the quiet seek mode slows down the WD3200JB by 4ms at an average, 7ms in case of the WD2500JB (see the diagram above), having become almost indistinguishable against the spin noise of the drives. If the manufacturer announces Mode 0 and Mode 3, it would be logical to assume that there exist two more seek modes (that is four modes in total) in these drives. But that's not true — these drives have only two seek modes. And, by the way, WD Raptor WD740GD unofficially has two seek modes as well, but the difference between them is just 1ms (by the average disk access time). Unfortunately, the acoustics management utility from Western Digital is not yet freely available (but it exists). That's why regular users will have to use third-party utilities in order to toy with seek modes in these WD drives to obtain noiseless or high-performance operation (for example, Hitachi Feature Tool). I also used a Windows utility, Abacus HDD Acoustic Manager (hddacman), in my experiments. We can try to judge about the efficiency of lazy write firmware procedures and caching data for writing by the drop of the average write access time, measured by the operating system, relative to the read access time with enabled write-back caching. We use C'T H2benchW results for this purpose. It turns out that these parameters (average access time for cached writing) in the new WD3200JB are more than 1ms less than in the Caviar SE drives with the previous-generation controller (WD2500JB and WD2000JB). In fact, the new WD drive is inferior only to Maxtor drives with a 16MB buffer, having outperformed the other competitors. To all appearances, the manufacturers were honest when they mentioned the significantly improved caching procedures. By the way, the absolute value of the average cached write access time in quiet seek mode is even lower that in default seek mode! While this parameter noticeably deteriorates (by 2.6ms) in the quiet seek mode even in the modern WD2500JB model. Can it be true that the caching policy for writing in the WD3200JB "toughens", when the seek mode is changed? However, the 0.1ms difference can be written off to a measurement error. Another illustrative test of the "interior design" and the firmware efficiency of the hard disks is the read/write speed on files of various sizes with various block sizes — from 512 bytes to 1 MB. For this purpose I traditionally use ATTO Disk Benchmark. The screenshots below display the results for the four sizes of a test file — 128KB, 1MB, 4MB, and 32MB. While the first and the second file sizes are, as a rule, surely cached in the disk buffer (caching read/write data for a 1 MB file is not that simple), there is simply no room to fit in the last file size. Caching the last but one file size depends not only on the buffer size, but also on the hard disk firmware (by the way, results of this test practically don't depend on the choice between FAT and NTFS). ATTO Disk Benchmark results for Western Digital drives. These test results demonstrate noticeable firmware differences among the three generations of WD Caviar SE drives. The progress is obvious. The difference between the recent WD2500JB and the two year-old WD2000JB is cardinal: significantly improved caching for reading files of up to 4MB (the drives used to have big problems even with 128KB files), eliminated downfall in writing one-kilobyte blocks. But even the upgrade to the WD3200JB showed that some issues could still be improved — accelerated operations (especially writes) with the smallest blocks, improved caching for writing small files (smaller than a megabyte), streaming writes (files larger than 4MB) also got evidently faster compared to the recent WD2500JB (with an old controller). Thus, we found another proof of the claimed firmware improvements in hard drives of the latest generation. Though WD programmers still have some issues to improve. Now let's see how the above-mentioned construction features of the drives show themselves in applications. At first, let's find out how well the hard disks are optimized for multithreaded operations. I traditionally use NBench 2.4 tests for this purpose, where 100MB files are written to disk and then read from it in several simultaneous threads — both closely and distantly located on the drive (in this case we used FAT32). This diagram lets us evaluate the efficiency of multi-threaded lazy write procedures of the hard disks in real (not synthetic, as on the diagram with the average access time) conditions when the operating system works with files. The traditional champions of lazy write procedures, desktop Maxtor drives (one of them has a 16MB buffer at that), are very difficult to compete with. The new Barracuda 7200.8 demonstrates excellent results as well. But then the WD3200JB took the honorary fourth place, having lost almost no performance in quiet seek (! ), while its predecessor lags noticeably behind in quiet seek mode. Now let's have a look how the hard drives fair in old but still popular Disk WinMark 99 tests from the WinBench 99 package. We carry out these tests not only for the beginning but also for the middle part (in terms of capacity) of physical hard drives for two file systems. The diagrams display average results. Maxtor with a large buffer is beyond comparison in "professional" (High-End) performance, it's again followed by the WD2500JB. It noticeably outperforms the WD3200JB, which is newer and faster in all parameters. It seems to me that it has to do with WD2500 firmware optimizations for specific patterns of this test. However, that's just my subjective assumption. The disk test in popular Futuremark PCMark04 is often used by common users for express-evaluation, though it's not free from shortcomings. We provide its results not for the sake of an objective picture, but to let our readers get their bearings on their own results. The latest Hitachi drive is beyond comparison here, WD drives (all four modifications, including the quiet seek mode) follow the leader, though the 250GB model outperforms the newer 320GB model again. Maxtor and Seagate drives are obviously slower here than WD drives. A similar track test C'T H2benchW is more critical to the differences between the models, but the recent WD2500JB goes again ahead of all and noticeably outperforms not only its 1.5-year old predecessor WD2000JB but also its successor WD3200JB! It "calms down" to their level in the quiet seek mode, but the WD3200JB operates almost as fast in the quiet seek mode as it does in the regular mode. Strange as it may seem, the new WD3200JB is obviously outperformed in all traditionally consumer tests (WinBench 99, PCmark04, C'T H2BenchW) by its updated predecessor WD2500JB with less capacious and slower platters and less efficient firmware and controller. That makes you pause, doesn't it? Fortunately, the new WD3200JB model proved oneself worthy in Adobe Photoshop swapping performance, being outperformed only by the excellent MaXLine III and obviously outperforming its predecessors and other 7200rpm competitors. We also use special patterns in Intel IOmeter to imitate hard disks operating in various applications. At first — traditional well-spread patterns, offered by Intel and Storagereview.com — DataBase, File Server, Web Server, and Workstation. Let's start with averaged data on the three server patterns and four queue depths (1, 4, 16, and 64). The data was averaged geometrically without weight coefficients. We again see that the recent WD2500JB turns out generally faster than the latest WD3200JB. The slow performance of the new drive cannot be explained by a worse seek time (it's simply not true, the linear rate is also not worse). That's why this situation can only be explained by differences in the firmware and caching procedures! You can see on the diagrams below that this lag is demonstrated at almost any queue depth. It's good news (it depends, though) that WD drives outperformed such a competitor, traditionally strong in server patterns, as a Hitachi drive! To say nothing of the new and especially the old Seagate drives. The situation with Hitachi grows a tad better only at the WebServer pattern without write requests, though WD outperforms the latest Seagate drive even here. Now it's turn for our own patterns for IOmeter, which are closer to users of home PCs, as well as to hard disk usage intended by the manufacturer. The situation repeats itself in the imitation of large file reading/writing (like mp3, video, large photos, etc): the recent WD2500JB turns out obviously faster than the latest WD3200JB. This drive alone can outperform the excellent drives from Maxtor and Hitachi. But the quiet seek considerably reduces its performance. Fast platters and new firmware do not save the WD3200JB from failure (let's be frank) here. The drive ranks are a tad different in the imitation of small file reading/writing — MaXLine III is in the lead followed by the WD2500JB and the WD3200JB, Hitachi Deskstar 7K400 is behind them. WD drives generally look worthy here, supported by the good legacy of server patterns. We can also note that the quiet seek mode in the WD3200JB does not deteriorate the random small write rate (it gets even a tad better — remember the average write rates above! ), only reading gets a tad worse. Unlike the WD2500JB, where both parameters suffer from the quiet seek mode. It means that the new models still have some improvements in firmware algorithms. File copying has been a traditional hobby-horse of programmers from Western Digital. The new drive is not an exception — having outperformed all drives in copying small files, it is outperformed only by the two "titans" at large files. The WD3200JB demonstrates good performance here at any seek mode — the default fast mode and the quiet slow mode. The previous WD Caviar SE models are obviously outperformed here. Both latest WD Caviar SE drives turn out approximately on a par according to the geometric mean of the three previous diagrams — one is faster in one mode, the other is faster in the other. However, the latest models from Seagate and especially from Maxtor look generally no worse. The WD3200JB is in the lead again in the defragmentation imitation, having outperformed even the traditional leaders in this field — Seagate Barracuda drives. Quiet seek turned out no obstacle for the new Caviar SE. And finally, MaXLine III drive is an absolute and unquestionable authority in the streaming read/write pattern with large and small blocks (which characterizes PC operations when editing digital video or digital VCR mode with timeshifting as a fashionable consumer electronics device). Seagate drives were traditionally strong here as well, though. That's why the success of the WD2500JB makes happy Western Digital fans, though the latest WD3200JB model is again obviously outperformed by its predecessor! Probably, WD programmers overlooked something when they "significantly improved" the firmware and broke some code, which had been fine-tuned in the course of time (or probably the reason was in the upgraded processor with the new assembler, where the entire code had to be rewritten considering the new specifics). Let's hope that they will sort everything out and resolve the problems. Personal computers, digital video recorders, and play stations have been increasingly often operating under conditions, when the noise is very undesirable. WD minimizes WD Caviar noise to levels virtually below the threshold of human hearing against other fans operating in modern computers with its WhisperDrive technology. But if a computer is very quiet, you will still make out a slight rotational noise from the WD3200JB. The Soft Seek technology, designed to cut seek noise, streamlines read/write seeking algorithms, resulting in the drive operating more efficiently when accessing and writing data. The drive works almost indistinguishably in quiet seek mode against the spin noise of the drive, though its performance in most desktop and consumer tasks almost does not suffer, as we have seen above. So, Western Digital successfully mastered 107GB platters in its desktop and hopefully consumer hard drives. We can only congratulate it on this issue, because in fact only Seagate offers platters of a higher density so far (133GB). 125GB platters in Samsung drives are a tad delayed, Maxtor is satisfied with its 100GB platters (and it's not going to upgrade them in the nearest future), and Hitachi still manufactures only 80GB-platter drives. 320GB models from WD are presently the second in capacity on the market (after 400GB models from Seagate and Hitachi), but they are noticeably less noisy and less hot than similar models from the competitors. The WD3200JB/JD drives with their current price only slightly exceeding $200 are a good choice for those PC users, who want a high-performance system of a high capacity, which will still be quiet and relatively cool. 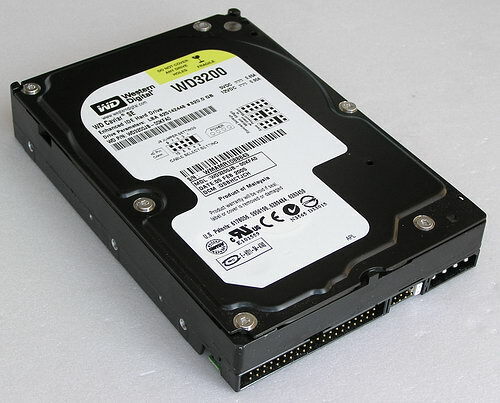 What concerns the performance of new WD Caviar SE drives (represented by the senior WD3200JB model) designed primarily for high-performance personal computers and inexpensive workstations (however, WD offers a special series of hard drives for RAID), the situation is ambiguous here. On the one hand, in comparison with the Caviar SE predecessors, we can see obvious improvements in linear read rates and caching algorithms for writing and anticipatory reading. It really has an effect in some applications — the WD3200JB demonstrates one of the best performances in its class. But on the other hand, the new drive turned out faster than its predecessor WD2500JB (released just a couple of months before on the updated basis but still with 80GB platters and the old controller) only in ONE THIRD (!) out of two dozens of performance tests in various applications. This will surely alert a careful customer. And we are going to keep tabs on the situation with the release of new versions of this product — there may be some improvements.